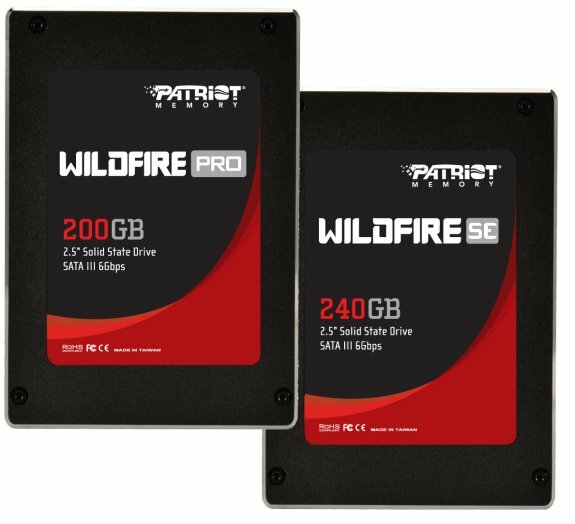 Patriot Memory introduced the Wildfire Pro and Wildfire SE, two new solid state disks powered by SandForce's SF-2281 controller. Patriot Memory, a global pioneer in high-performance memory, NAND flash, storage, and enthusiast computer products, today expanded their Wildfire brand of SATA III solid-state drives with the launch of its new Wildfire Pro and Wildfire SE. Driven by the SandForce® SF-2281 processor, the Patriot Memory Wildfire Pro and Wildfire SE deliver true next generation performance for amazingly fast productivity, gaming, and HD content creation. Offering high-end professional and enthusiast experiences, the Wildfire Pro and Wildfire SE are the performance flagships in Patriot Memory’s solid state drive ecosystem. With read and write speeds of up to 550MB/s and 500MB/s, the Patriot Memory Wildfire Pro and SE are designed for those who demand extreme performance to push the limits of power computing. With enhanced built-in overprovisioning while also utilizing wear leveling technologies such as DuraClass™ and DuraWrite™ , the Wildfire Pro will provide extended protection from strenuous professional applications. The Wildfire SE will also incorporates the same advance wear leveling technologies to protect against the wear and tear of high-end usage.